I really like the new Thief. Perhaps if I’d played the original 1998 game, I’d have found more to disappoint me. But most of the negativity seems to focus on 1) big glitches and bugs (which I luckily didn’t encounter too many of) and 2) the story being a mess — which I completely agree with, but godawful writing doesn’t stop some games getting rave reviews. Maybe it’s just that I’ll forgive Eidos Montreal anything after the brilliant Deus Ex: Human Revolution. Hands! Amazing. Particularly when you slide your fingers along the underside edge of paintings, looking for secret switches, and get a fingers-sliding-along-the-underside-edge-of-a-painting sound so perfect it makes your wrist hairs stand on end. Puzzles in the hub city are exactly right. Just when you’ve tried everything and go to turn away, convinced that you’re missing some crucial ability or item, the solution hits you like a blackjack to the back of the knee. So I had a conversation with my friend Nick about some forgotten ruins in a different game: Tomb Raider (the new one). He was dismayed that the game’s tombs, which are supposed to be all old and mysterious and heavy with the atmosphere of many centuries’ abandonment and ruin, are dotted with lit torches. Something of an atmosphere killer. 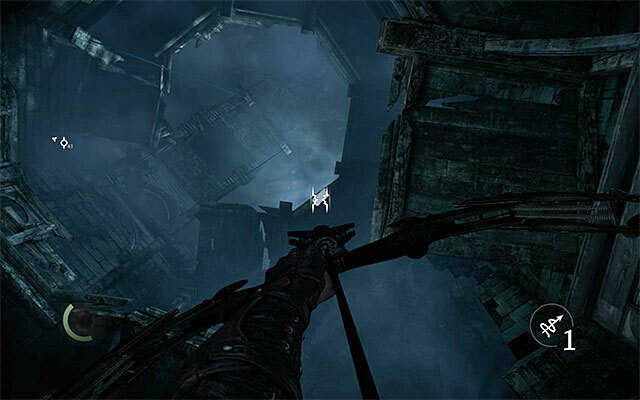 Thief’s Forgotten Ruins is how to do it right. After a long series of puzzles in the Blossom House brothel, a hidden stone door opens up in a basement. You head through it into dark tunnels. Garrett mutters, “This has gone forgotten for a long time.” And that’s the moment it hits you that you’re completely alone. You’ve found somewhere no-one else in the city knows exists — and it’s chilling to realise that this essentially puts you outside the game. Because, down here, the developers can’t rightfully have a guard patrolling the next corner or a shopkeeper idly waiting for your custom*. All the world’s characters are far above you, totally oblivious to this ancient place. Normal play has been put on hold. The unsettling feeling of solitude comes a little bit from the primal fear of being stuck underground far away from help. But it comes a lot from the pure power of suggestion. A little thought keeps tapping at the edge of your skull: if there definitely isn’t an NPC around the next corner of this ancient and lonely place — what the hell is? It got really creepy, and I felt this cold chill down my spine, which has never happened before in a game. And I wasn’t sure if I’d be able to continue playing this game. And it was all just me scaring myself — no mechanics! The music’s kept minimal in Thief’s ruins– and as you descend deeper, the distant splash of water behind the walls gets louder and fuller, until you’re faced with a subterranean waterfall, still powering a crumbling waterwheel. Now you feel truly underground. And you’re as awed as Garrett to then discover an entire library, caked in dust but otherwise preserved for centuries. It’s brilliant design. And there are no lit torches. * Actually, Thief does have shopkeepers in unlikely places. There’s one in the main town who’s decided to peddle his wares in a tiny space that can only be reached by opening a small knee-high vent and crawling through. Not the brightest business mind there.